The Ministry of Culture, Sports and Tourism on Monday announced that it will present the Geumgwan Order of Cultural Merit, the highest honor of its kind, to late designer Lee Young-hee, who specialized in the Korean traditional hanbok. Lee, who passed away on May 17 aged 82, was one of the best-known designers in the country. 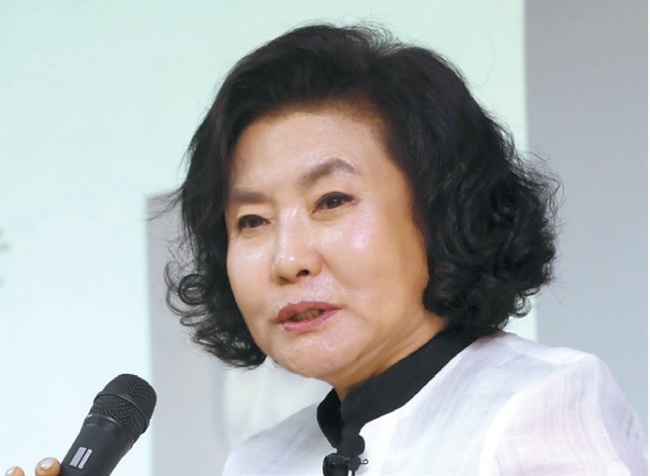 “For the past 40 years, she contributed to promotion of hanbok culture, its modernization and worldwide proliferation of hanbok while also educating those who followed in her footsteps,” the ministry said. Lee is considered to have established her own unique style of hanbok, blending the modern and traditional, Korean and Western, styles in her designs. The medal was due to be awarded to her bereaved family during the opening ceremony of the 2018 Hanbok Cultural Week in Jeonju, North Jeolla Province, at 7 p.m. Monday. A fashion show in tribute to the late designer will also be held at the ceremony. The Geumgwan Order of Cultural Merit is given to individuals who have greatly contributed to the development of Korea’s culture and arts. The most recent recipient was novelist Choi In-hun, best known for his 1960 novel “The Square,” who also posthumously received the honors in July.